In 2017, we founded [Re]Build America’s School Infrastructure Coalition (BASIC), a non-partisan coalition to advocate for a ten-year $100 billion investment as part of the nation’s critical infrastructure package. But reducing inequity in our nation’s public school facilities will take a variety of tools. These tools are needed at the local, state, and federal levels. Could the new federal Opportunity Zone Program help modernize public school facilities in low income communities? One of the provisions of the Tax Cuts and Jobs Act of 2017 was the creation of “Opportunity Zones” (OZs). Opportunity Zones are structured to provide capital gains relief to investors who invest gains from prior inves tments into a Qualified Opportunity Fund, which uses the invested cash to invest in a Qualified Opportunity Zone Business. (See sections 1400Z-1 and 1400Z-2 of the Internal Revenue Code). The deep tax cuts from the bill are likely to stress states and already disadvantaged communities, but the OZ program may be one provision that could be used to benefit low-income communities, not just individuals and corporations seeking to further lower capital gains taxes. But, the jury is out on whether or not the Opportunity Funds will help revitalize low-income communities. One way to meaningfully impact the economic vitality of low income communities, is to modernize their public school facilities. Modern public school facilities are capital assets that bring educational and economic benefits to schools and their communities. Modernizing the schools themselves provides jobs, and modern school facilities helps retain teachers in schools. Families are more likelyto stay and move to communities with modern school facilities, and employers are more likely to stayand locate in communities where students have experienced modern workforce technologies in school. Community uses for public schools modernized to support health clinics, adult education, recreation, and elder services can be an important contributor to neighborhood well-being and vitality. And yet, capital financing for school construction is the most regressive public education funding, low income communities suffer inequitably from the $38 billion a year gap in capital requirements. There should be $10 billion a year of block grants to states to help reduce the gap and the inequity, but if IRS clarifies its rules so engaging in public private partnerships with school districts, municipalities, counties, and even states to do public private partnerships to modernize public school infrastructure, communities may be able to accelerate the important modernization of our public school buildings and grounds. This summer 2018, the IRS designated 8,762 qualified Opportunity Zones (OZs) across the country. Nearly three-fourths (72%) of them have at least one elementary or secondary public school in them. In total, America’s newly designated OZs have 13,536 elementary or secondary public schools. 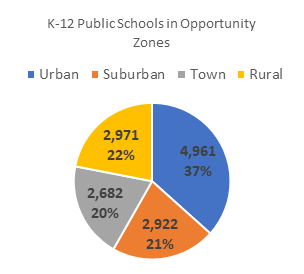 As the pie chart displays, these schools can be found in urban, suburban, town, and rural areas. The schools in OZs serve a high percentage of children from disadvantaged families. On average, OZ schools have 71% of their students coming from low-income families. On average, OZ schools have 68% of their students coming from racial and ethnic minority households. From a capital asset perspective, the 13,536 OZ schools use a great deal of infrastructure and land– we estimate about 850 million gross square feet of building space and thousands of acres of land. As we write this, there are many as-yet-unanswered questions about what types of projects the Opportunity Funds will be able to invest in. Preliminary guidance from the IRS is expected soon. A major question that will impact whether investments from Qualified Opportunity Funds can be used for public-private partnerships to benefit public school facilities will be whether this activity will be a “qualified business.” We propose that it should. Public-private partnerships that align local public needs for modern public school facilities with new private capital, and real estate, project and facilities management professionalism can be done with or without “Opportunity Zones.” But clear IRS guidance that includes public private partnerships to modernize public school facilities as a qualified business could increase the benefits school districts can secure in a public-private partnership, expand the capacity of the public sector to engage in partnerships, and reduce their cost.